Abstract: Objective To explore the mechanism of resveratrol in neural remodeling in the infarcted rat myocardium. Methods Rats were randomly divided into 3 groups:a sham group (n=10), in which sutures were passed but not tied; a surgery group (n=10), in which the anterior descending artery was ligated; and a resveratrol group (n=10), in which the anterior descending artery was ligated combined with resveratrol injection. At four weeks after surgery, the level of nerve growth factor (NGF) and interleukin-1β (IL-1β) at the border zone was measured with western blotting; the expression of NGF and IL-1β mRNA was examined with real-time polymerase chain reaction. Results Compared with the sham group, the level of NGF and IL-1β in the surgery group was significantly increased (P < 0.01). Compared with the sham group, the level of NGF and IL-1β in the resveratrol group was significantly increased (P < 0.05). Resveratrol significantly reduced the expression of NGF and IL-1β compared with that in the surgery group (P < 0.01). Conclusion After acute myocardial infarction, resveratrol reduced the expression of NGF protein and mRNA in rats. 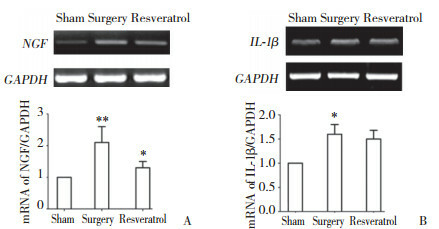 Resveratrol also decreased the expression of IL-1β protein and mRNA. Our findings suggest that resveratrol can prevent ventricular arrhythmia and sudden cardiac death by inhibiting cardiac neural remodeling. 1）P < 0.01，2）P < 0.05 vs sham group；3）P < 0.01 vs surgery group.